Founded in the year 2000, 18 year-old entrepreneur Grayson Tighe made his mark as the youngest professional pen designer and maker in the world. Under the direct tutelage of his father, renowned knife designer and maker Brian Tighe, Grayson’s passion for designing and creating functional art pieces just seemed to come naturally. 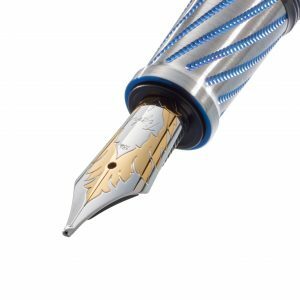 Today, a Grayson Tighe pen is recognized for its timeless design, precision craftsmanship and sophisticated use of materials; pure Titanium is a trademark in his work, in addition to Fossil Ivory, Stainless Steel Damascus, Mokumé-gané, Sterling Silver, Gold, and other rare materials. For Grayson, innovation and integrity of materials is key. With an artist’s vision for creativity, coupled with an entrepreneur’s drive to push the boundaries of his industry, Grayson continually strives to create the finest hand made, elegant writing instruments for his clientele. He has received numerous awards and accolades for his work including 6 Readers’ Choice Awards from Pen World Magazine.